The right-wing conservative group ‘Patriot Prayer’ rallied in the streets of Berkeley Saturday afternoon to discuss intolerance, issues on President Trump, racism and fascism. Christie Smith reports. "Previous rallies have turned violent and into clashes. Those involved in the Empathy Tent have been there through it all and were back there today, They say trying to listen and promote dialog. " Protesters keep their cool at pro-Trump, anti-Trump rallies. ‘Empathy tent’ helps. "The event also sported an “empathy tent,” where organizers promised “10 minutes of deep listening” without judgment, advice or interruption. Edwin Rutsch, head of the Center for Building a Culture of Empathy, spent the afternoon sitting face to face in folding chairs with people who stopped by to talk politics, religion or whatever else struck them." 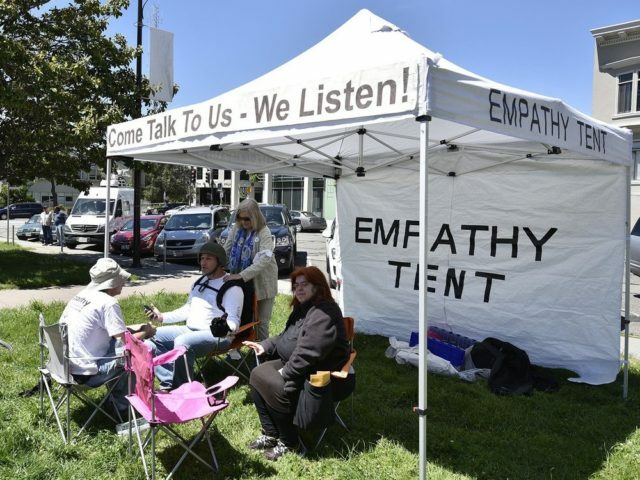 "The Sacramento Bee reported that as police worked to keep about 150 pro-Trump demonstrators and a smaller group of anti-Trump protesters from coming to blows, peace activists used an “empathy tent” to defuse tensions: ...The “empathy tent” has been deployed elsewhere, most recently at demonstrations in downtown Los Angeles:"
Most people, when heard with empathy, want more of it. What if the value of empathy permeated our culture? This is the vision that guest, Edwin Rutsch, brings to us. Host Marlena Willis dialogues with him about his vision for how to create a world where the value of empathy permeates all our institutions. "As demonstrators left the rally, they passed a modest white tent on the lawn of City Hall, with a sign reading “Empathy Tent.” Inside, Edwin Rutsch of Berkeley sat on an orange camping chair, mediating a discussion between a Trump supporter and an impeachment marcher. They sparred over whether Trump had ever lied or committed any impeachable offenses, their voices sometimes rising." "Hours after the Impeachment March on July 2, a sizable group loitered around a tent set up on the grassy area south of City Hall known as Fletcher Bowron Square. The center of this activity was a contingent of activists from the Center for Building a Culture of Empathy based in the Bay Area. On this day, they were staging a series of dialogues between opposing members representing the ongoing debate nationwide about the legitimacy/viability of the presidency of Donald J. Trump. " "The escalation in Berkeley causes concern among some of the college town’s establishment... To the extent Berkeley is supposed to be representative (of liberal movements) we are being used,” said David Gottfried, part of a small group of local residents who set up an “Empathy Tent” at the edge of the demonstration and encouraged the shouting masses to consider listening and dialogue instead. It wound up being hit by pepper spray. “There was hardly anyone from Berkeley there, except of course the police,” said Gottfried, a self-employed artist who, at 58, is roughly twice the age of most of the combatants ignoring the tray of chocolates he held out." Gottfried worried that the product of the day would be an escalation of extremism." The Conservative Millennial’ blogger Allie Beth Stuckey on how ‘empathy tents’ are being used at UC Berkeley to calm down protesters. "Well, better that than throwing punches and pepper spraying people." "On the other end of the spectrum, someone actually set up an “Empathy Tent” where people could go to take a break and get a massage during the rally. No, really. There’s someone giving massages at the Empathy Tent –"